My 10 HOPES for the New Year! 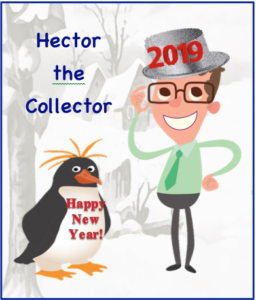 - Credit Mediators Inc.
It’s Hector the Collector and now that the New Year has begun, it’s also a time for me to set some HOPES for this year. I use the word “HOPES” because every year when I proclaim my “resolutions,” I just get too overwhelmed trying to make them a reality. Maybe you feel the same. So, here are my ten HOPES, which I hope you’ll find hopeful as well. 1) Curtail My Social Media – This is at the top of my list since I know I’m spending way too much time on Facebook, LinkedIn, and Instagram. I have to admit I’m always very curious (maybe borderline addicted) about what my friends are doing during the day, but I’m going to try and limit my time on these platforms to when I’m only at lunch, on my break, and hopefully only thirty minutes in the evenings. 2) Don’t Stress Out – I do have a tendency to get overly annoyed when little things don’t go my way. It’s probably due to the fact that I’m an obsessive-compulsive Type A personality and expect everyone to return emails within one hour like I do. I know it’s just not going to work that way and I have to calm down and redirect my focus. 4) Get Prepared – Time again I’ve made too many calls to debtors where I didn’t have everything in front of me and ended up having to call them back. Unfortunately, sometimes that was the last chance I had to communicate with them and missed an important collection opportunity. 5) Get a Mirror – I’ve been asked more than once, “Why are your frowning?” Well, I’m going to work on my attitude this year to really try and maintain a positive outlook and appearance. Not only for myself but also for the good of everyone else around me. I think a mirror on my desk will help me to catch those moments when I need to turn a frown into a smile. 6) Get Rest – This probably should be first on my list. No more late nights texting with friends, reading my news feeds, sending emails, or watching Law & Order, etc. If I can get to bed by 11:00pm and get a good night’s sleep, I know my performance at work will really zoom. 7) Drink up – I love a good cup of fresh coffee with my croissant in the morning, during breaks, after lunch, and even a late afternoon picker-upper. No wonder I can’t sleep at night! Going to switch to no sugar flavored water and see how that works for keeping me hydrated. 8) Eat up – I’ve heard about the GOMBSS diet (greens, onions, mushrooms, berries, seeds & nuts, and sweet potatoes) and it is supposed bring about excellent overall health benefits. Mind you, I’m not going vegan — I’m just going to include more veggies and eat meals with smaller portions. 9) Exercise up – Although long cold winter days make me want to just stay indoors and hibernate, thank goodness my best friend gave me ten Zumba classes at the health club near the office. Now I have no excuse not to go! 10) Laugh up – Because it’s cold where I live, I find myself not laughing like I do during the warm summer months. I guess that’s because I don’t see anything humorous about pretending to look like a penguin before facing temperatures of minus ten below with the wind chill. But then again, the thought of turning into a penguin does make me smile. 11) Sneak Away – Although the title of this article says “10 HOPES,” I’m throwing this one in for good luck. Since calling debtors day in and day out can be stressful, I hope this will be the year when I treat myself to some reasonable time off to get refreshed and rebalanced. With the above HOPES in mind, I’m greatly looking forward to having a very hopeful year with all of you. Hector the Collector is a credit and collection advice column by Nancy Seiverd, President, CMI Credit Mediators Inc. Your thoughts and comments (nseiverd@cmiweb.com) are most welcome!